You might not think of looking for world-class theater performances in the tiny town of La Jolla near San Diego. That is unless you're a knowledgeable theatergoer who really knows their stuff. The La Jolla Playhouse has a long tradition of innovative productions of old classics and even more for nurturing new works. If you want bragging rights with your friends, saying: "Oh yes, I saw that and knew it was bound to be a hit," La Jolla Playhouse is the place to go. In the past 20 years, more than a dozen plays have made their way to Broadway from La Jolla Playhouse stages. They include Jersey Boys, I Am My Own Wife, and The Who's Tommy. Six of those won Tony Awards, and one garnered a Pulitzer Prize. Over their history, the La Jolla Playhouse has created 26 productions that have transferred to Broadway, earning 35 Tony Awards. In 1993, the Playhouse won its own Tony, for regional theater. Their season runs from April through early December, and you can get more details at the La Jolla Playhouse website. To all that acclaim, I add a hearty standing ovation for one of the best performances this frequent theatre-goer had seen in a long time. I saw Memphis there, and when it went to Broadway, I could brag that I saw it first. Some TripAdvisor reviews say: "Performances are consistently outstanding, and the collection of shows is always very diverse and at times unique." and "It's Broadway by the Beach." We rate the La Jolla Playhouse 5 out of 5 for its long tradition of excellent work and the quality of the performance we saw. My only regret is that I live too far away to go more often. La Jolla Playhouse performs on four stages, all of them located on the edge of the University of California at San Diego campus. See more information about each one below under Seating. Performances tend to sell out, but the theaters are roomy, and there's plenty of space around to accommodate all the people, so it doesn't feel crowded. There's a small parking lot on the campus that you can use during the week. Note your space number and pay at the kiosk near the theater using cash ($1 and $5 bills) or a credit card. Only one restaurant is within walking distance of the theater. Get information about it here. 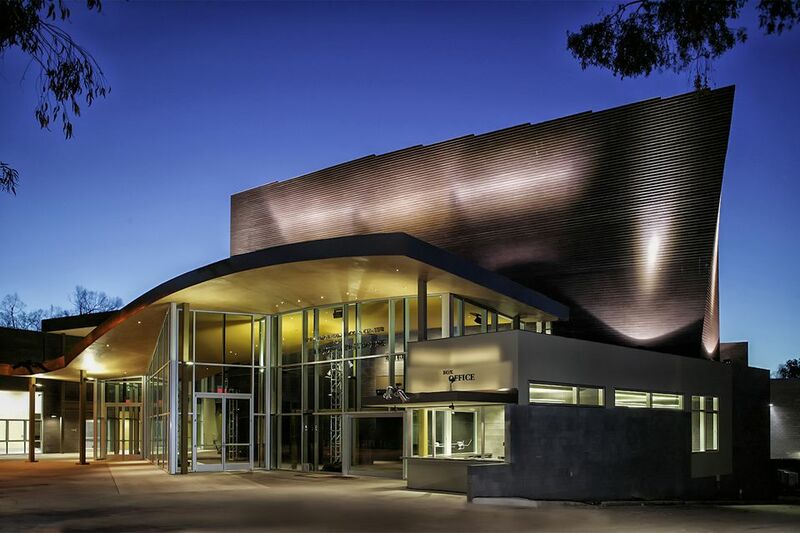 Mandell Weiss Theatre: The largest theater at La Jolla Playhouse has 492 seats and a proscenium arch stage — that's a traditional stage with an open front wall. Mandell Weiss Forum: Designed by award-winning architect Antoine Predock, the forum has 400 seats and thrust stage where the audience sits around it on three sides. Theodore and Adele Shank Theatre: A 98-seat theater adjacent to the Mandell Weiss Forum. Sheila and Hughes Potiker Theatre: A black box, a flexible theater that seats up to 450 people. The name "black box" comes from the fact that many theaters of its type (which are mostly used for experimental works) are painted black and could be located anywhere. Ticket prices at La Jolla Playhouse vary, depending on the show and performance date. Previews and weekday nights are least expensive. Find out about all the discounts they offer, including 30 and Under, military and student discounts. To avoid disappointment, buy your tickets early online, by phone at 858-550-1010, or at the box office. The Playhouse is at 2910 La Jolla Village Drive, La Jolla (on the UCSD campus). You'll find driving directions at the La Jolla Playhouse website. As is common in the travel industry, the author received complimentary tickets for the purpose of this review. It has not influenced the outcome. However, Tripsavvy.com believes in full disclosure of all potential conflicts of interest.